KARA KAR has been building trailers since 1962 and there's nothing they haven't seen or done, with superior engineering, the finest materials and a state of the art assembly plant they guarantee the best and safest towing trailer available. The trailers are aerodynamically designed to ensure stablilty and ease of towing, whilst also improving fuel economy. The trailers are designed with structural integrity, durability, safety and exceptional performance with minimal maintenance. 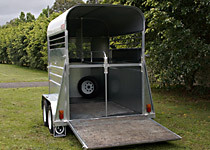 Built by horse people for horse people every trailer is safe, functional and user friendly for both horse and rider. With a 5 year stuctural warranty you can rest assured that every float will provide ongoing reliability with practical features to make transporting your horse a pleasure. With an extensive range of optional extras, you can be sure to find the right accessories to customise your float to your specific needs. Please call in and visit us to view the range of features or contact us for further information.